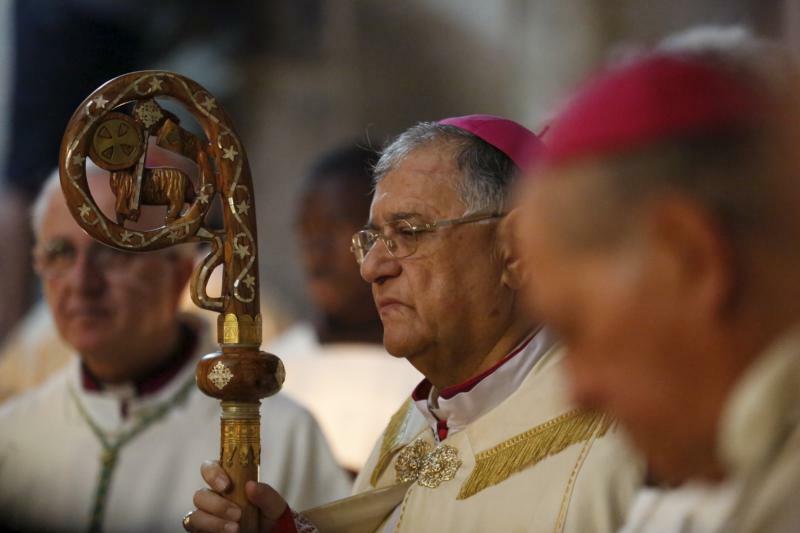 BEIRUT (CNS) — Catholic patriarchs of the Middle East, in their Easter messages, pleaded for peace and urged their faithful to regard the risen Christ as a sign of hope. Lebanese Cardinal Bechara Rai, Maronite Catholic patriarch, said the world — particularly the “political community and the rulers of nations” — badly needs “witnesses to the resurrection.” He called for the resurrection of “humanity, justice and peace” in his Easter message. “We Christians, while concluding our Lent, pain and cross of these difficult days … are called not to keep looking at our wounds and lose hope” but, instead, to celebrate the Resurrection “as our most beautiful and joyful feast,” Patriarch Sako said. Referring to the recent bombings in Belgium last week, Patriarch Twal asked Bruno Jans, consul general of Belgium in Jerusalem, who attended the Mass, to convey condolences and prayers to his people and government. “Peace is so meaningful today for our Syriac church and for people enduring persecutions during the centuries and most particularly in recent times at the hands of the barbarians of the 21th century,” the Syrian-born patriarch said, citing attacks in 2010 and 2014. “Despite all kinds of hardship endured because of your forced migration — either to Lebanon, Jordan or Turkey — we will continue to pray with Pope Francis in the Year of Mercy, beseeching God, father of all mercies, to have mercy on all of us, that the world, particularly the Western nations may believe,” Patriarch Younan said. “In the face of the tragedies of the peoples of our Middle Eastern countries, especially in Syria and Iraq, we are all walking on the path of Golgotha. But as the way of the cross led to the glorious Resurrection, so we pray to get through the way of the cross in Syria, especially to the joys of the Resurrection,” Patriarch Laham said.